Interested in attending one of our Talk Stories? Visit one of our fee-owned properties or conservation easements and learn about conservation, history, culture, and biology through our Talk Story on the Land series, a series of free, guided hikes. Don't miss an opportunity to experience a variety of wahi pana and learn more about HILT's work. Complete a Talk Story on the Land Liability Waiver here and a HILT Staff member will be in touch to confirm your spot! Don't forget to fill out a Visit Report Form after you attend a Talk Story event to share manao, moolelo, and photos! 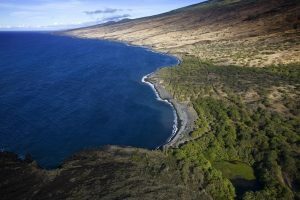 Hawaiian Islands Land Trust’s 2019 Talk Story on the Land series is generously supported by the Hawaiian Electric Industries Foundation via Maui Electric Company, Ltd. and the Atherton Family Foundation. Mahalo! Join Jennifer Luck, HILT Board Member and Managing Director of Wai Koa Plantation, along with Gary Smith, Jack Gushiken, Devin Kamealoha Forrest for a short hike of the Wai Koa Loop Trail. Learn about the area's history and importance to the community with HILT’s staff, board members and Island Council volunteers. We will provide coffee and pastries for a meet and greet at the beginning of the day. Wear sunscreen, a hat, and bring water. Be prepared for rain with a rain jacket (umbrellas are not advised) and if you are sensitive to mosquitoes, bring bug spray. Meet at Anaina Hou Cobblestone Patio (near mini-golf food court) at 8 AM. Join Scott Fisher, Associate Executive Director of Conservation for a morning hike at Waihee Coastal Dunes & Wetlands Refuge. Learn about the area's native plants and animals as well its history and myths. Wear sunscreen, a hat, and bring water and a snack. Meet across from Waihee Elementary School at 9 AM. Join Scott Fisher, Associate Executive Director of Conservation for for this special moonlight hike at Waihee Coastal Dunes & Wetlands Refuge. HILT offer's this experience only once a year, so don't miss out! Learn about the area's native plants and animals as well its history and myths inspired by the glow of the full moon. Light refreshments will be provided. Wear sturdy shoes and bring a flashlight. Meet at the Red Roof House beyond the gate and past the parking area at 5:30 PM. Join Scott Fisher, Associate Executive Director of Conservation, for a morning hike at Nuu Refuge. Learn about the area's native plants and animals as well its history and myths. Wear sunscreen, a hat, and sturdy shoes. Bring water and a snack. Meet at Keokea Park at 9 AM. Join Scott Fisher, Associate Executive Director of Conservation, for an evening hike at Hawea Point in Kapalua. Watch our native uau kani arriving to spend the night in their burrows. Wear sturdy shoes and bring a flashlight. A meeting place will be determined prior to the hike, meet at 6 PM. As parking is limited at this site, we can only accommodate ten people, please carpool or use alternate forms of transportation where possible. If you’re a community group or a school interested in booking a Talk Story on the Land hike, please contact Scott Fisher. Groups of 10 or more are welcome!